The Occupational Safety and Health Administration (OSHA) enforces a long list of workplace standards. Each year OSHA produces a list of the ten standards that employers violated the most during the previous fiscal year. The latest list was published by Safety and Health Magazine. It reflects violations that occurred during the 2018 fiscal year (October 1, 2017, to September 30, 2018). OSHA's "top ten" list doesn't change much from year to year. Nine out of the ten standards on the 2018 list appeared on the 2017 list as well. The only major difference is item ten. In 2017, the Electrical Wiring standard (1910.301) was in tenth place. In 2018, it was replaced by the Eye and Face Protection standard. Here is the "top ten" list for 2018. The standards are arranged in descending order beginning with Fall Protection, which generated the most violations. Half of the standards (numbers 1, 3, 6, 8, and 10) apply only to employers in the construction industry. The rest apply to employers in all industries. 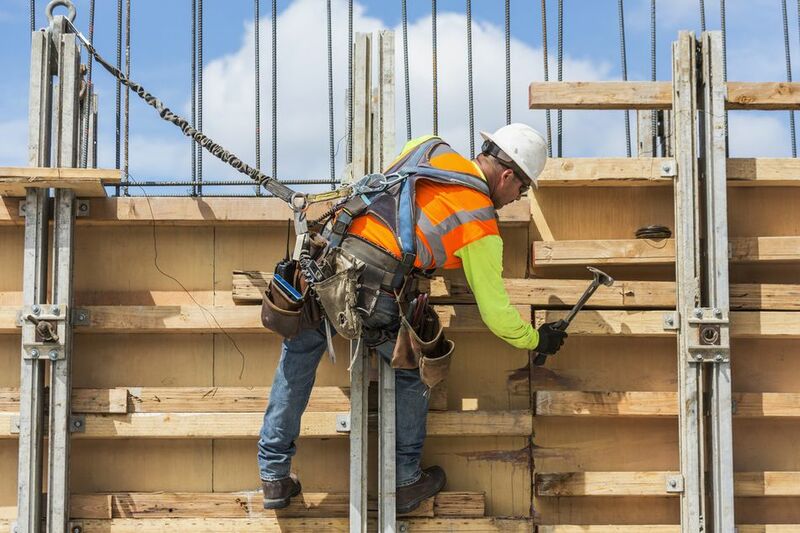 Standard 1926.501 is designed to protect construction workers from fall-related accidents, a leading cause of work-related deaths and serious injuries. A construction site can have numerous fall hazards. Workers may tumble off high places like ladders, roofs, and steel beams. They can fall into or over equipment or machinery located at ground level. Workers can also fall into underground holes or trenches. Standard 1926.501 is intended to prevent falls at all levels. The Fall Protection standard requires employers to provide fall protection systems when employees are working at elevations of six feet or more. Examples are guard rails, safety harnesses, safety nets, toe-boards, and hole covers. OSHA offers a variety of helpful resources at its fall protection webpage. OSHA's Hazard Communication standard is intended to prevent employee injuries caused by exposure to chemicals. It requires employers to educate employees about the hazards of chemicals by implementing a written hazard communication program. To comply with Standard 1910.1200, employers must provide workers with a list of all hazardous substances in the workplace. They must explain the dangers of those substances and train workers how to use the materials properly. Employers must also provide appropriate protective gear (such as gloves and masks) and train workers how to use it. The Hazard Communication standard was amended in 2012 when new labeling requirements were added. It now requires manufacturers and importers to classify the potential hazards of chemicals they make or bring into the country and to describe those hazards on the label. Once those products enter the workplace, the employer must ensure they are properly labeled. Construction workers often perform work off the ground with the aid of a scaffold. Scaffolds that aren't constructed properly may collapse or tip over, causing injuries to workers. Scaffold-related injuries are most likely to occur when employees are climbing on or off the structures, or while they are erecting or dismantling them. The Scaffold standard 1926.451 is intended to protect workers from injuries caused by falls, falling objects, electrocution, or collapse of the scaffold. The standard establishes requirements that must be met when scaffolds are erected, used, or dismantled. Employers must ensure that all workers who use scaffolds receive the proper training. OSHA's Respiratory Standard 1910.134 is intended to protect workers from exposure to dust, vapor, fumes, gases, smoke or sprays. Workers who inhale these substances may sustain lung injuries. Those exposed over a long period of time may develop an occupational disease like silicosis or asbestosis. The Respiratory standard requires employers to create, maintain, and enforce a respiratory protection program. Employers must identify airborne hazards in the workplace, select the proper respirator to safeguard workers, and train employees how to use the equipment. Employers must also monitor the workplace to ensure that respirators are used and maintained properly. Many workers are injured while servicing machines that start up unexpectedly or release stored energy. For example, a worker is cleaning a mixing machine when a fellow employee accidentally activates the "on" switch. The mixer begins to operate, seriously injuring the worker inside. Alternatively, a worker is doing maintenance work on a piece of equipment when he is shocked by electricity retained in the machine's electrical system. OSHA's Lockout and Tagout standard is intended to prevent such injuries. Both lockout and tagout devices prevent a machine from operating but tagout also contains a warning label. The label notifies workers that the machine can't be operated until the tagout device is removed. Lockout or tagout devices may be used on equipment powered by electrical, hydraulic, or mechanical energy. Many of the fall injuries that occur in workplaces every year involve the use of ladders. Because ladders are used in many different industries, OSHA's Ladder standard applies to all employers. There are various types of ladders that may be used in a workplace. These include stepladders, portable ladders, and fixed ladders. To reduce ladder accidents, employers should first try to reduce or eliminate the need for ladders altogether. Projects can be designed so that most of the work is performed on the ground. Another option is to replace ladders with safer alternatives such as aerial lifts. If a ladder must be used, employers should ensure that workers use the right type of device for the task they are performing. They should also provide proper accessories, like a safety belt and harness, when needed. All workers should be properly trained how to use ladders safely. Many workers are injured while using forklifts, lift trucks, and similar types of mobile equipment to move heavy loads. OSHA calls such vehicles powered industrial trucks. Injuries may occur while employees are entering, exiting or maneuvering a vehicle, or while they are handling a load. Vehicle drivers may cause injuries to fellow employees. OSHA's Industrial Trucks Standard prohibits the use of certain vehicles when the atmosphere contains hazardous materials. Employers must train workers on the proper operation of forklifts and certify that all drivers have received the proper training. Standard 1926.503 requires employers to provide fall prevention training to any worker who might be exposed to fall hazards. Workers must be taught how to recognize the hazards of falling and how they can avoid injuries through the proper use of fall protection equipment. Employers must keep a written record certifying that each worker exposed to fall hazards has received appropriate training. The record must include the name of the worker, the date the training was completed, and the signature of the trainer or employer. Employers can find tips on how to set up a training program in OSHA's fall prevention training guide. Many workers operate machines that cut, punch or shear materials like metal, wood or plastic. These machines may contain parts that rotate, reciprocate (move up and down or back and forth), or move with a transverse motion (in a straight line). Some contain rotating parts (such as interlocking gears) that come together at nip points. Cutting or punching machines can cause serious injuries, including amputations. OSHA's Machine Guarding standard helps prevent such injuries. It requires employers to ensure that all hazardous machinery is properly guarded and that the guards are maintained. Many guarding devices are available. Examples are fixed guards, pressure-sensing devices, safety trip controls, and gates. Construction workers may sustain eye or face injuries from flying particles, molten metal, caustic substances, gases, vapors, and other hazards. Standard 1926.102 requires employers to provide safety glasses, goggles, or face shields to protect workers from injuries. The device must be suited to the task being performed. Safety glasses may be appropriate for a worker cutting wood but a worker doing welding work will need a face shield.